Beyonce Knowles appears to preview a new song in a cute video she has shared on Instagram. In the short clip arriving on Wednesday, April 1, the R&B diva is seen flossing her teeth alongside her beloved daughter Blue Ivy. Bey and her little girl both sport matching round sunglasses by Sunday Somewhere with green floss picks in their mouths. Blue even rocks a giant gold chain, probably her dad's, while making a peace sign with her hand. 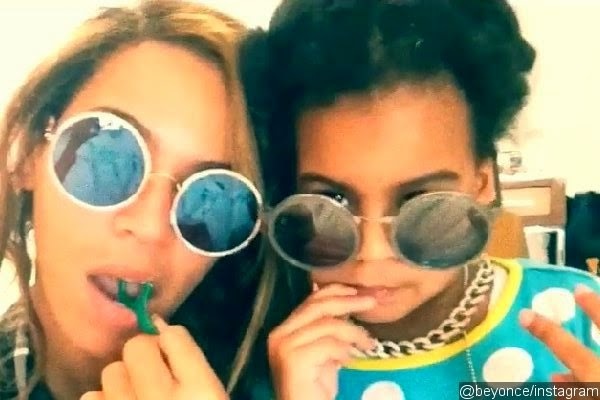 As Beyonce shows Blue the proper way to floss, a new song is played in the background. The song, featuring Bey repeatedly singing, "Flossin'," is reportedly called "Bounce" and also features contributions from Jay-Z and Timbaland. It was previously previewed in 2013 during Robinson Cano's birthday party.